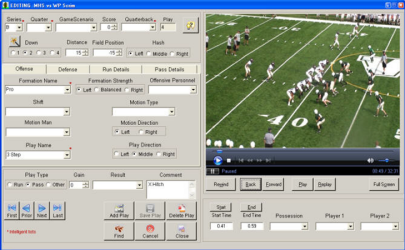 Video Editing software is used by football coaches for a number a purposes. 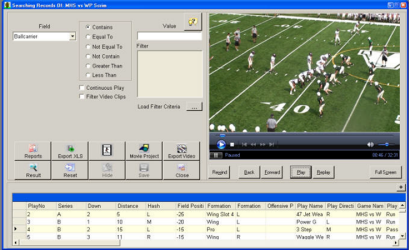 Most video editing software enables a coach to use a computer's organizational and video playback capability to watch game video more efficiently. Plays are "indexed", or categorized at the same time the play is viewed - without changing screens. Easy-Scout products use your football terminology, and learns it "on the fly" to automatically build lists of Formations, Plays, Fronts, Coverages and more ! Once games and plays are "indexed", individual plays or groups of plays can be retrieved - literally in seconds, for immediate viewing - individually, in "playlists" or to produce "cutups" and highlight videos. In addition, reports can be generated that reveal tendencies and help produce game plans.